The new Cyrus One amplifier is official, yours for £699 | What Hi-Fi? Cyrus has already teased teased details of the new amplifier, but now it has officially been launched at the Munich High End Show. After releasing a few details last month, Cyrus has now revealed the full specification and feature list of the new, affordable (£699) One amplifier. 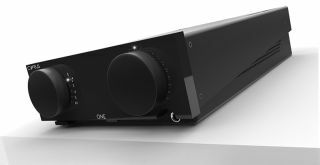 The amp will deliver 100W per channel and uses Cyrus’s hybrid Class D technology, which is now in its third generation. It's half-width chassis may look familiar, but the One is actually slight bigger than previous units, measuring 85x220x390mm (HxWxD). It also sports a high gloss black finish with rubberised controls and has a funky light sequence when you turn it on. Headline features include a built-in phono stage, aptX Bluetooth streaming and a high quality headphone amplifier. Cyrus says the One is aimed at people aged 18-30 who are “design-led, feature and interface driven”, and who “naturally” want to stream music from their smartphones and tablets. The Bluetooth connection on the One is in an “always discoverable state” meaning pairing with a device should be instantaneous. Cyrus is also aware that the same demographic are contributing to the vinyl revival and so has fitted a high quality moving magnet phono stage and four line level inputs for connecting other components, including a turntable or CD player. The One also has an AV bypass mode which allows it to be used in home cinema systems. The Class AB headphone amplifier springs into action as soon as you connect a pair of headphones, which also sees the toroidal power supply switching over from main amplifier duty, to dedicate itself to the headphone amp. Cyrus says the One is able to deliver a “wonderfully detailed, coherent and open musical presentation” thanks to the large amount of high current power available and that finding the right speakers to pair with it won’t be an issue. The One comes with automatic Speaker Impedance Detection (SID) which is said to instantly measure the impedance of any pair of speakers you connect, and adjusting the amplifier to suit. Cyrus promised the One would represent the company’s “most affordable price ever” and at £699, it’s lived up to that claim.